Villanova has an all-time record of 293-62 (.825) at the Pavilion. From 2007-11 it won 46 consecutive games on campus and from 2013-17 it posted 48 straight wins there. The Wildcats record at the Pavilion includes going 136-43 (.760) against BIG EAST opponents, 157-19 (.892) against non-conference opponents and 36-9 (.800) versus Big 5 foes. The Wildcats closed out the Pavilion with a 79-63 victory over No. 23 Creighton on Feb. 25, 2017. 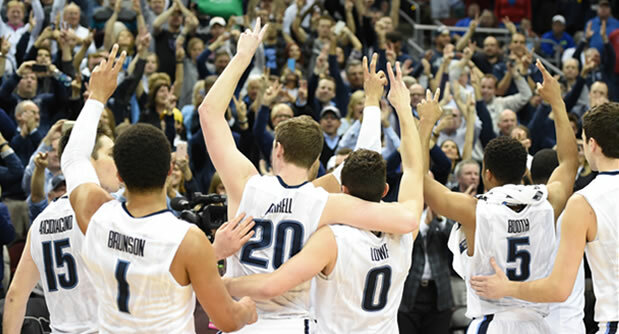 It marked the final home game for seniors Josh Hart, Kris Jenkins and Darryl Reynolds, who played on teams that went 46-1 at the Pavilion from 2013-17. There have been just 15 overtime games in Pavilion history, and just two in the last 14 seasons. Villanova is 8-7 in overtime games at the Pavilion. There has never been a game that advanced past a first overtime. The all-time attendance at the Pavilion is 2,270,190. 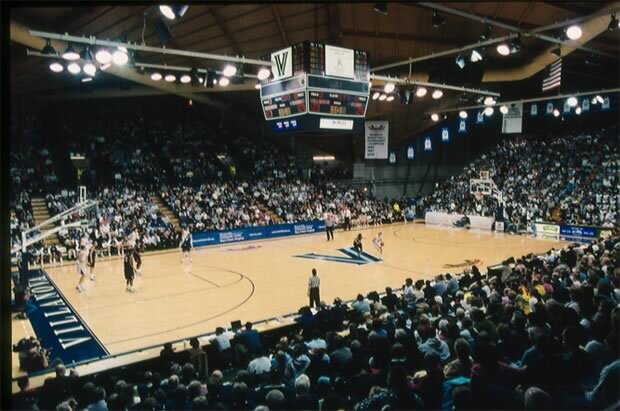 Villanova drew its one millionth fan in the building during the game against Rutgers on February 20, 2000. The team reached two million in all-time attendance on December 15, 2013 against La Salle. Of the 355 games that Villanova has played at the Pavilion, 327 (92 percent) have been sellouts. Villanova has currently sold out 182 consecutive regular season games in the building, a streak which began on January 2, 2001 against Rutgers. Every regular season game in the Jay Wright era has been a sellout. Villanova is 24-20 against nationally-ranked opponents at the Pavilion and has beaten four teams that were ranked in the top five of the Associated Press Top 25 at the time of the game. Those four wins came against No. 3 Connecticut on February 15, 1994; No. 3 Boston College on February 23, 2005; No. 5 Connecticut on January 11, 1992; and No. 5 Oklahoma on December 3, 2005. The first men’s basketball game in the Pavilion was on February 1, 1986 against Maryland. 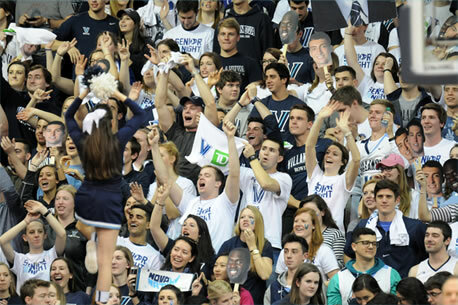 Villanova won the game, 64-62, in front of a crowd of 6,401 fans. The Wildcats, who were defending national champions when the Pavilion opened, had a starting lineup of Harold Jensen, Dwight Wilbur, Doug West, Mark Plansky and Harold Pressley in the first game in their new building. 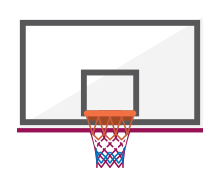 Harold Pressley made the first basket of that game on a driving hook shot with 18:57 left in the first half. He finished the game with a team-high 10 rebounds, while Harold Jensen led the Wildcats with 13 points that day. 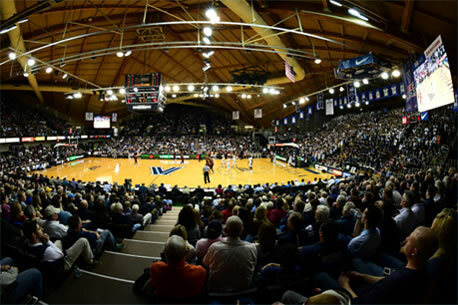 The most common visiting opponent in the Pavilion is Seton Hall, which has played in the building 24 times. Seton Hall also holds the record for the most losses in the building by a visiting team with 19. On the flip side of that statistic, the visiting team with the most wins at the Pavilion is Providence with seven. 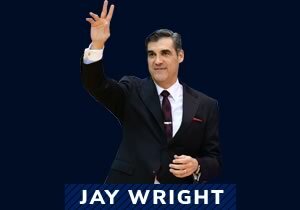 Jay Wright has a career record of 161-20 (.890) at the Pavilion, including a 93-5 (.949) record against non-conference opponents and a 68-15 (.819) record versus BIG EAST foes. The only two teams to be a part of the BIG EAST Conference who never played a game in the Pavilion are Syracuse and Louisville. The Wildcats have a winning record against every BIG EAST opponent that has played at the Pavilion. During a 96-68 win over Providence on February 20, 1988, Villanova guard Gary Massey had a Pavilion record nine steals. On February 28, 1995 against Boston College, Kerry Kittles set the floor record for points in a single game when he scored 44 points. He is the only men’s player – including both Villanova and visiting teams – to have a 40-point game in the building. The most points by a visiting player is 38 and was accomplished by both Jamel Thomas of Providence (February 20, 1999) and Jason Conley of VMI (December 22, 2001). 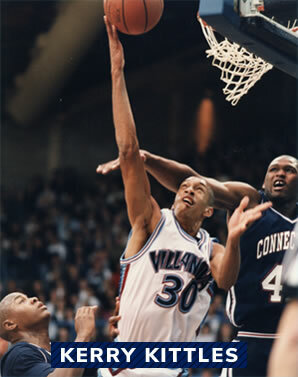 The career scoring record at the Pavilion is 873 points by Kerry Kittles (1992-96). He also holds the records for career minutes played (1,556) and steals (114) in the building. Gary Buchanan (1999-03) made a record 154 career three-pointers in the Pavilion, 39 more than runner-up Allan Ray (2002-06) with 115 triples. Brooks Sales (1998-02) holds the career record for most games played in the Pavilion with 55. The only other players who have played at least 50 games in the building are Gary Buchanan and Ricky Wright, who each played in 51 Pavilion games from 1999-03. Villanova senior guard Josh Hart is eighth on the Pavilion career scoring list with 617 points. Ahead of him in seventh place is Scottie Reynolds (2006-10) with 636 points. The single-game record for rebounds in a Pavilion game is 21 and was set by Lionel Simmons of La Salle on December 22, 1988. The only Villanova player to have a 20-rebound game at the Pavilion is Harold Pressley, who had 20 rebounds against St. John’s on February 18, 1986. That was just the third game ever played in the building, and the 20-rebound feat has not been accomplished by any Wildcat since. Villanova has lost 62 games all-time at the Pavilion, and just 19 have been by double digits. The team’s only loss by more than 20 points in the building was by 26 points to Providence on February 11, 2004 (100-74). That game also marked just the second time that an opponent scored 100 points in the building. La Salle defeated the Wildcats by a score of 102-94 on December 22, 1990. Villanova has scored at least 100 points 13 times in Pavilion games. The record for most points in a game is 108 against Rider on December 22, 2006. Villanova has also scored 50 or more points in all but one game in the building. Its lowest scoring output was 43 points against Pittsburgh on January 16, 2013. 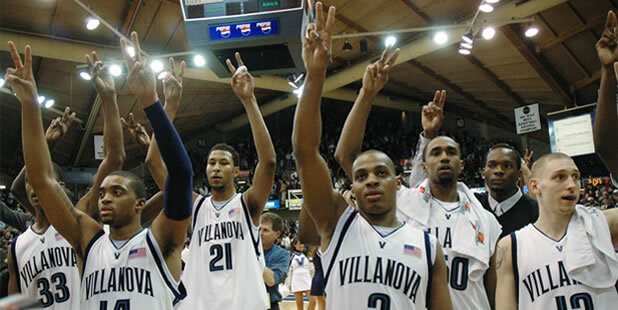 Villanova made a building record 17 three-pointers in an 84-47 win over Lehigh on November 27, 2005. Since the three-point rule was instituted for the 1986-87 season, the Wildcats have made at least one triple in 344 of the 347 games they have played in the building. 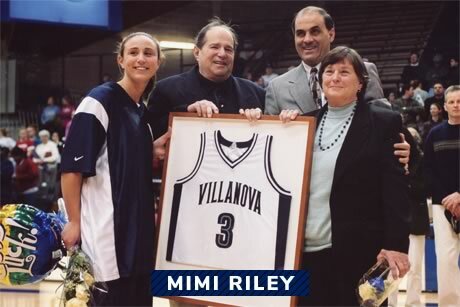 Mimi Riley scored the most points by a Wildcat women’s player in the Pavilion with 34 points versus Virginia Tech on Feb. 23, 2002. The first-ever basketball game in the Pavilion was a 62-53 win by the Wildcat women over the University of Pittsburgh on Jan. 22, 1986. The Wildcats hosted 18 in-season tournaments at the Pavilion and went 26-10 (.730) in those tournaments, winning the tourney title on 12 occasions. 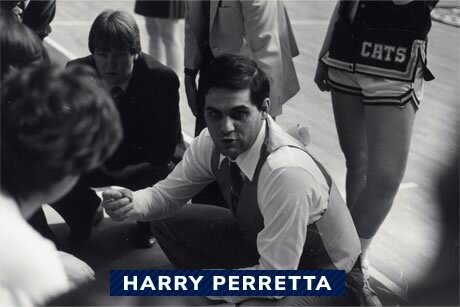 Harry Perretta has won the most games in the Pavilion with 262. The Wildcats beat No. 1 Connecticut 59-56 before a sold out crowd on Senior Night (Feb. 28, 2004). It was the second straight win over No. 1 UConn. 20 Wildcat women’s players who scored 1,000 career points played at the Pavilion. The most points scored by the Villanova women at the Pavilion was 99 in a 99-55 win over Penn on Dec. 20, 1997. The Wildcats made a school record 18 three-point field goals on three occasions at the Pavilion vs. Binghamton (12/13/07), WVU (01/03/01) and Penn (12/20/97). 125 different women’s players have worn a Wildcat uniform in games played at the Pavilion.